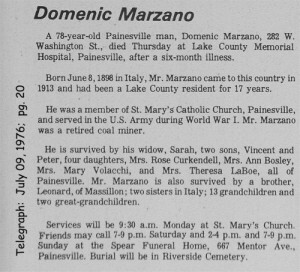 Domenico Marzano first appears in the Painesville, Ohio, area in 1957. 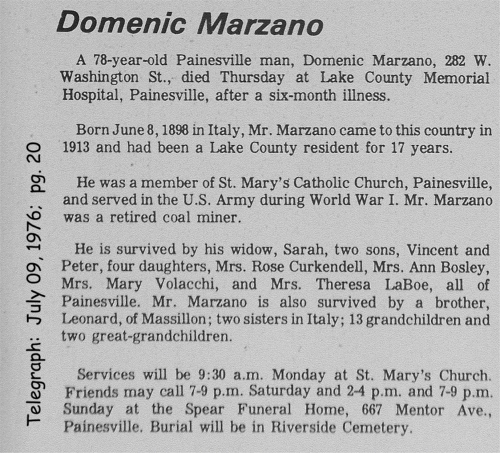 In America, Domenico Marzano was known as Domenic Marzano. Domenico Marzano, son of Vincenzo and Rosa Marzano, was born on June 8, 1898, at Portigliola, Italy. He married Sarah Catonzaro, daughter of Sam Catonzaro and Anna Grasso. Domenico died on July 8, 1976, at Lake County Memorial Hospital, Painesville, Lake County, Ohio, at age 78. His body was interred at Riverside Cemetery at Painesville, Lake County, Ohio. Domenico Marzano immigrated to the United States on August 18, 1913, at age 15, travelling to Clarion County, Pennsylvania. He was joining his father, Vincenzo Marzano, in Clarion County. Domenico served in the United States Army during World War I. He was employed as a coal miner in West Virginia until he retired. When he retired, Domenico and Rosa migrated to Painesville where is children lived. At the time of death, Domenico resided at 282 West Washington Street, Painesville, Lake County, Ohio. 1. Rose Marie Marzano was born on December 22, 1927. She married Deward Elzey Curkendall in 1946 at Barbour County, West Virginia. 2. Anne E. Marzano was born on January 22, 1928. She married Hartsel Ray Bosley in 1954 at Barbour County, West Virginia. Anna died on November 9, 2010, at Geauga Medical Center, Chardon, Geuaga County, Ohio, at age 82. Her body was interred at Riverside Cemetery at Painesville, Lake County, Ohio. 3. Vincent J. Marzano was born on May 25, 1930. He married Palmina J. Minnitti, daughter of Paolo Minniti and Rosaria DiLeto, on February 23, 1952. Vincent J. died on June 3, 1996, at age 66. His body was interred at Riverside Cemetery at Painesville, Lake County, Ohio. 4. Sam Marzano was born on April 1, 1932, at Fairmont, Marion County, West Virginia. Sam died on November 10, 1933, at Marion, West Virginia, at age 1. His body was interred at Maple Grove Cemetery at Fairmont, Marion County, West Virginia. 5. Teresa Marzano was born on June 6, 1932. She married Jack LaBoe, son of Jack LaBoe. 6. Peter Marzano was born on September 17, 1934. He married Laila Jean Ashton in 1954 at Barbour County, West Virginia. 7. Mary C. Marzano and Sarah Catonzaro, was born in June, 1936. She married Eugene L. Valocchi, son of Vitale Valocchi and Mary Martone, in 1953 at Barbour County, West Virginia.